Brooklyn Bridge Park and Manhattan. Pine siskins have moved in! 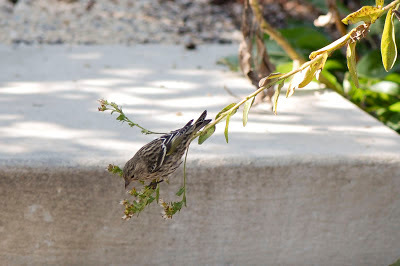 I saw a flock of pine siskins in Brooklyn Bridge Park a few weeks ago. Just behind the row of red bushes in the photo above, the little birds were collecting seeds from plants and grasses. They chatted softly while they flitted from plant to plant, sometimes fluttering to stay balanced while perching on the end of a stem. When pine siskins fly we see flashes of yellow feathers on their wings and at the base of the tail. Little pines siskins, Spinus pinus, are easy to overlook. They are about five inches long and only weigh about half an ounce. They are mainly brown with streaks on body and head. Pine siskins are residents across southern Canada and at high elevations of the western United States. They breed in western Canada. In winter they sometimes migrate south, or irrupt, into other areas. They move further south in eastern North America and into lower elevations in the west. Changes in food availability are thought to inspire irruptions. Some years the siskins stay put, other years they suddenly appear in New York parks and gardens. Pine siskins eat seeds of conifers like pine, cedar, hemlock, larch, and spruce. They also eat seeds of birch, sweet gum, maple, and alder. And they eat the tiny seeds of grasses, dandelions, ragweed, and other plants. They occasionally snack on an insect or spider. They are happy to come to feeders for thistle and sunflower seeds. Pine siskins sometimes travel with other irruptive migrants like crossbills, redpolls, purple finches, evening grossbeaks, and goldfinches. Birdwatchers call these the winter finches; I hope to see some of them in Brooklyn Bridge Park, too! But the park has been closed for a week because of hurricane Sandy and has just reopened. I'm on my way out to look for finches. I'll report back.